A new exhibition by a Hanoi-based painter Le Thong present a romantic ideal of Asian beauty. 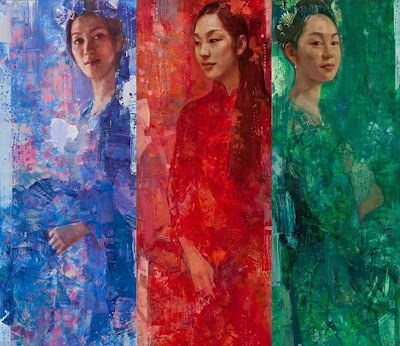 Like a poem on a canvas, the figures exist in a world between dream and reality, the delicate face and slender hands drawn in minute detail, while the figures are half hidden behind a textured surface suggesting the soft, luxuriant folds of silk fabric. 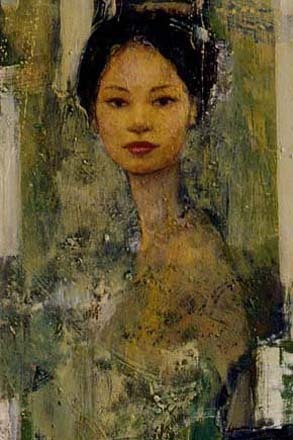 Le Thong was born in 1961 into an artistic family: his father, Le Thiep (1924-2000) was a well-known artist who taught at the Hanoi Fine Art University, where Le Thong is now also a lecturer. After completing five years' study at the University, Le Thong continued his education for another six years at the Kiev Academy in Russia.